The 2018 Hyundai Accent begins its fifth generation. Launched initially in 1994 as a 1995 model, the Accent replaced the Excel, which was Hyundai?s fist model to be sold in the U.S. The first generation lasted until the 2000 model year appearing initially as either a three-door hatchback or a four-door sedan. It was powered by a 1.3-liter or 1.5-liter four-cylinder engine. Since its introduction, over 1.2 million Accents have been sold in the U.S. 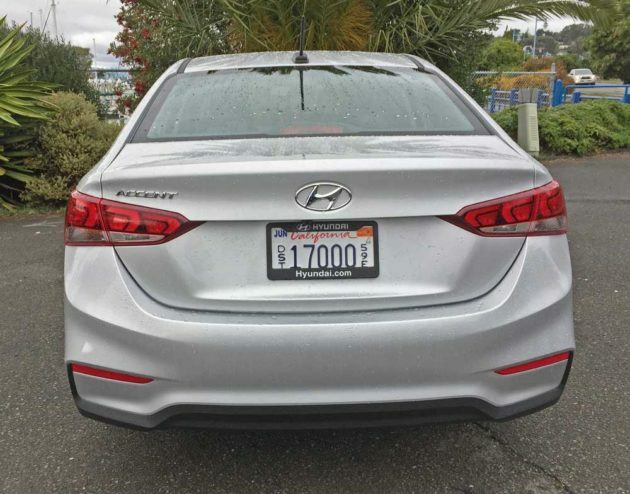 This latest Hyundai Accent, which is available in three levels of trim, is now only available as a four-door sedan and is powered by a 1.6-liter, DOHC, 16-valve, dual CVVT inline four-cylinder engine with Gasoline Direct Injection that delivers 130 horsepower at 6,300 rpm along with 119 pound feet of torque at 4,850 rpm. The transversely front mounted engine mates to either a standard 6-speed manual gearbox or a Six-speed automatic transmission with a gate-type Shiftronic?, overdrive lock- up torque converter and Hillstart Assist Control. The EPA highway mileage estimate for the manual is 37 mpg ? add 1 mpg for the Automatic. The new Accent?s trim levels are: the base model SE starting at $14,595; a more upscale SEL that begins at $$17,295; and the top model Limited with a starting price of $18,895. In terms of its appearance, the 2018 Hyundai Accent?s design displays sculpted body forms and smoothly contoured lines and edges resulting in a new interpretation of Hyundai?s signature design language. 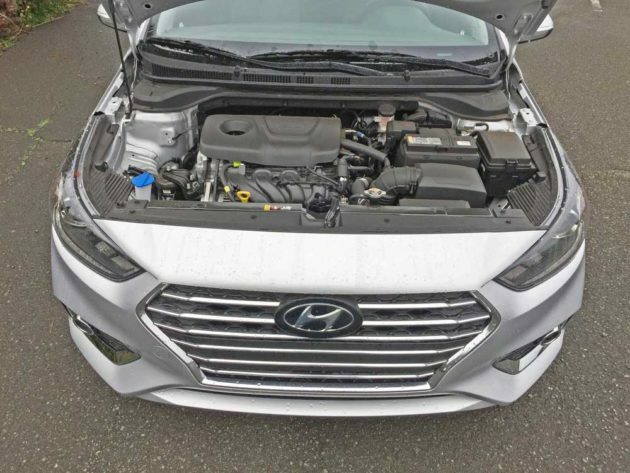 Up front is Hyundai?s signature cascading grille, which is flanked by wraparound headlights and available LED signature daytime running lights. In profile, the sweeping roof and sharp character lines traverse the length of the car. These character lines meet available slim LED wraparound taillights. Features such as 17-inch alloy wheels and side mirror LED turn signal indicators add to the upscale feel of the car. The car?s functional form achieves a balance between design and engineering with aerodynamic improvements. The Accent?s underside is also sculpted for aerodynamics. A new front-lip spoiler, combined with a lower ride height, contributes to its design efficiency. These features result in a 0.28 coefficient of drag. The 2018 Accent when compared to the last generation, is larger and provides more interior space. It is 1.2 inches wider, and the overall length has grown by 0.6 inches. The height remains unchanged, delivering a more grounded stance. The wheelbase has also increased 0.4 inches, pushing the wheels out to the corners contributing to the roominess of the interior, now up to 104 cubic feet. 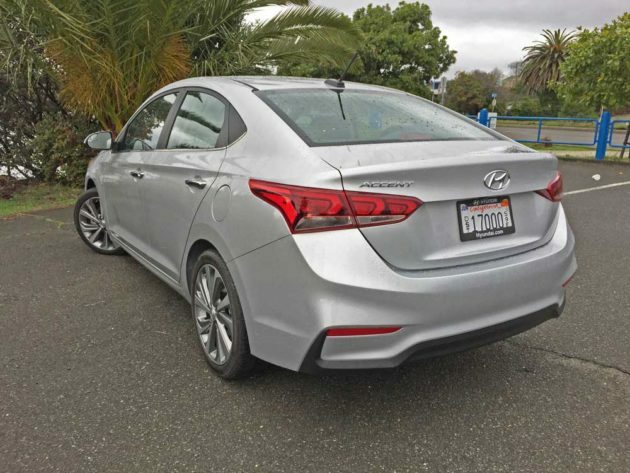 Hyundai claims an improvement in torsional rigidity of 32 percent. The cabin showcases a pleasing simplicity that isn?t luxurious mind you, but isn’t lacking in creature comforts either. The interior ambience level increases with each step up the model scale. 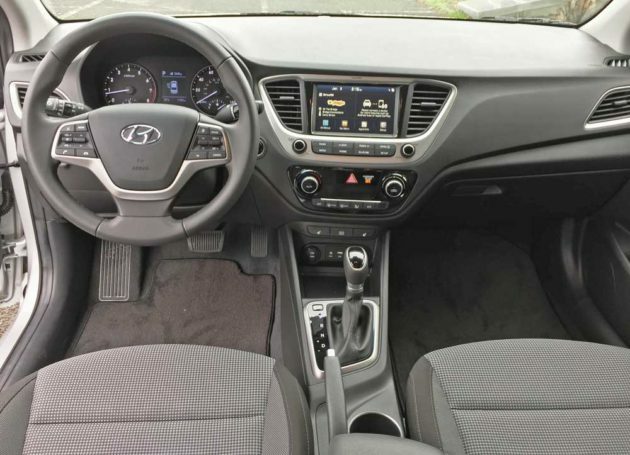 For instance, the SEL or Limited trim levels provide an additional USB port for back seat occupants, and the infotainment touchscreen bumps up from 5 to 7 inches. 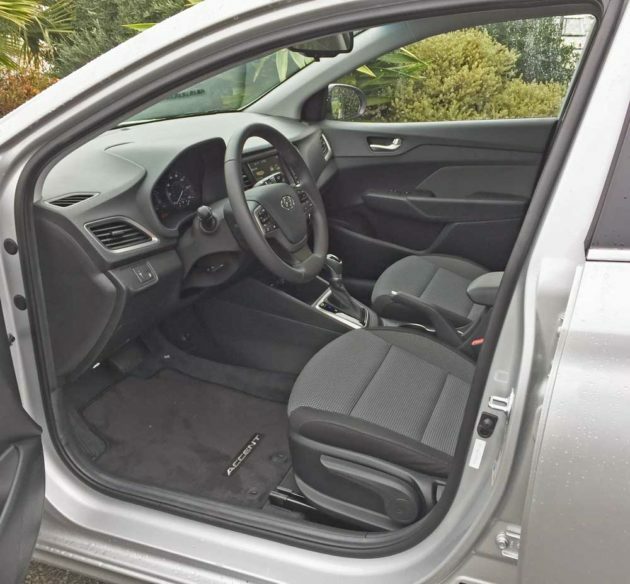 All models come with a 60/40 split folding rear seat and six airbags as standard fare. Wind noise has been reduced for a quieter interior, which enhances audio quality with both Apple CarPlay and Android Auto ? included with the 7-inch screen, and Hyundai?s Blue Link system now integrates with Amazon Alexa and Google Home, allowing the remote start of the vehicle by speaking to a device located in ones? home. A more meaningful feature is the available forward-collision-avoidance system that warns the driver of an impending impact and automatically applies the brakes if the driver fails to react quickly enough. 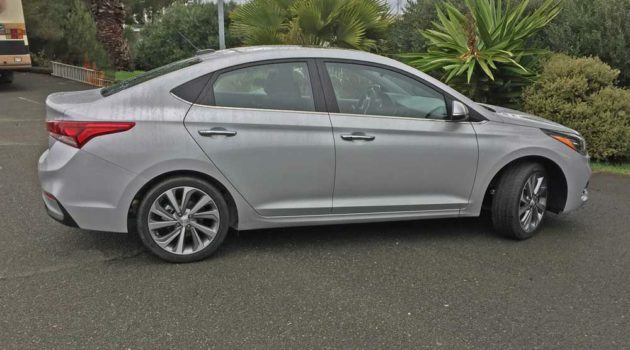 My test 2018 Hyundai Accent arrived in Limited trim with a Silver metallic exterior and cloth interior executed in patterned Black and grey tones. The base sticker read $18,895. With the as tested price totaling $19,905. After adding the Destination and Handling charge. 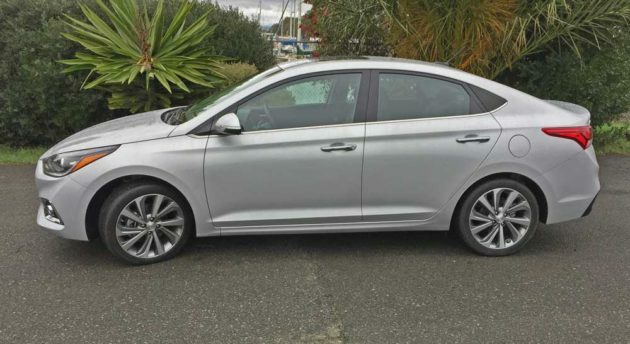 SUMMARY: The 2018 Hyundai Accent four-door sedan in Limited trim represents a sound choice for efficient, entry level transportation. It?s not likely to stir the avid auto enthusiast’s emotions, but it serves its purpose quite well. 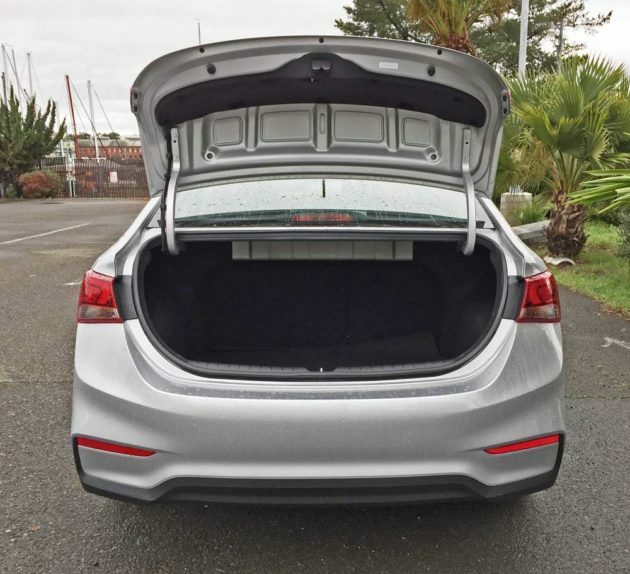 There were no optional features on my test vehicle, as the Limited model comes with pretty much all available features and equipment for the Accent for less than $20,000. Acceleration was adequate for a normally aspirated 130 horsepower four-cylinder engine, although a tad more torque would have proved to be beneficial, since 119 pound feet is pretty minimal. I?ve heard that the manual gearbox seems a little perkier than the automatic transmission, but I didn’t have the opportunity to make a personal comparison. The Automatic provides a switch operated drive mode selector that transitions from Normal to Sport, which improves response. The ride quality is compliant and comfortable, and the handling characteristics deliver a responsive feel if not Sporty. In a bottom line assessment, this latest Hyundai Accent represents an outstanding value and it comes with the Hyundai Assurance program, which includes a 5-year/60,000-mile fully-transferable new vehicle limited warranty, Hyundai?s 10-year/100,000-mile powertrain limited warranty and five years of complimentary Roadside Assistance. Hyundai Blue Link? Connected Care provides owners of Hyundai models equipped with the Blue Link telematics system with proactive safety and car care services complimentary for three years with enrollment. These services include Automatic Collision Notification. Engine Type and Size: 1.6-liter, DOHC, 16-valve, dual CVVT inline four-cylinder with Gasoline Direct Injection. Transmission: Six-speed automatic with gate-type Shiftronic?, overdrive lock- up torque converter and Hillstart Assist Control. Suspension: Front – MacPherson strut with coil springs, twin-tube gas shock absorbers and 22.2mm stabilizer bar. Rear – Coupled torsion axle with coil springs and twin-tube shock absorbers. Brakes: Power-assisted Dual-diagonal, split circuit, braking system w/ pressure valve, front discs, rear drums with ABS, Electronic Force Distribution. Electronic Stability Control, Vehicle Stability Management Electronic Stability Control, Vehicle Stability Management and Traction Control. Tires: Continental ProContact 205/45 R17 mounted on 5-stylized ?V?-spoke ? 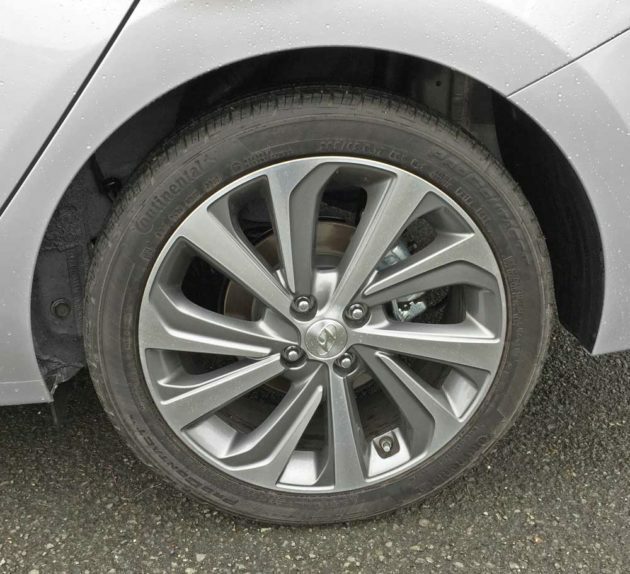 two-tone alloy wheels.